John Orwin was a powerful lock forward and occasional No.8 who played 201 games for Gloucester between 1976 and 1986. He captained Gloucester in 1984-85 and 1985-86, Bedford in 1987-88 and 1988-89 and England in 1988. He won 14 England caps. He played for Gloucester in the 1982 JPS Cup Final and was on the winning side for Gloucestershire in the 1984 County Championship Final. He also played for the Barbarians, RAF, Combined Services, Oxfordshire and the South West. John Orwin was born on March 20 1954 in Bradford. On leaving school he joined the RAF and made his RAF rugby debut in the 1975-76 season. One of his early matches resulted in an 87-6 defeat for the RAF at Twickenham – a Harlequins club record at the time! On March 27 1976, he made his debut in the Inter-Services Championship, playing No.8 for the RAF against the Royal Navy at Twickenham. He was now stationed at Brize Norton and joined the Gloucester club, making his debut at Kingsholm on September 25 1976 against Bristol, playing alongside Steve Boyle in the second row. Two months later he played for Oxfordshire in the County Championship ¼ final against Gloucestershire at Kingsholm and the following year played again in the ¼ final against Gloucestershire at Oxford. He played 32 games in 1978-79, his first full season for the club, which started with a rare 13-3 victory for Gloucester at Coventry on September 19. A week later he played for Southern Counties against an Argentine XV at Portsmouth and on November 21 for Combined Services against the All Blacks at Aldershot. Unavailability and fierce competition for second row places restricted his appearances the following season, but in 1980-81 he played more regularly and made his County Championship debut for Gloucestershire. John Orwin was a member of the great 1981-82 Gloucester side which only lost three games. He played for Gloucester in the1981-82 JPS Cup Final against Moseley at Twickenham and for Gloucestershire against Lancashire in their losing semi-final at Kingsholm. He also played for Combined Services against the Australians at Aldershot in December and he was a member of the RAF team which in April became Inter-Services Champions for only the fourth time since 1945. 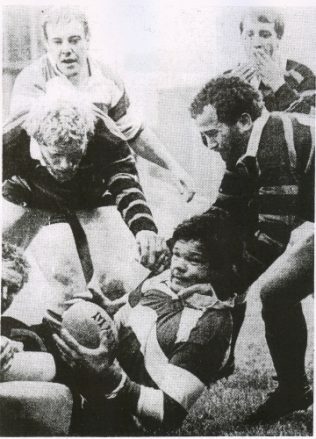 In October 1983 John played for Combined Services against the Canadians at Portsmouth and the following month for the South and South West against the All Blacks at Bristol. He played in the 36-18County Championship victory over Somerset at Twickenham, having missed the 1983 final due to suspension. John Orwin was elected Gloucester captain for 1984-85, a season in which the club won 32 out of 48 matches played and scored 1103 points. He played against the Australians both for South & South West at Exeter on 20 October and for Combined Services at Aldershot the following week. He made his England debut on January 5 1985 against Romania at Twickenham, four days after playing for the South West against the same opponents at Kingsholm. Wade Dooley also made his international debut in that match, but the Times said that Orwin “had the more effective all-round game.” John went on to play in all four home internationals that season. He toured New Zealand with England in summer 1985 and played in both tests. He was re-elected captain for 1985-86, the club winning 32 out of 47 games played and scoring 1030 points. He made his Barbarians debut on October 22 1985 at Newport and played for South and South West throughout their campaign in the Inter-Divisional Championship, but lost his England place. A hamstring injury handicapped Orwin in March and April 1986, but he returned to lead Gloucester to a 29-15 victory at Sale on April 19 which enabled the club to win the first John Smith merit table. He went with Gloucester on their May 1986 USA tour but, on leaving the RAF that summer, he became landlord of a public house near Bedford and joined the Bedford club for the 1986-87 season. John Orwin gained a further 7 England caps in the three seasons that he was at Bedford and in 1988 was chosen to captain England on their summer tour of Australia.. He captained Bedford in 1987-88 and 1988-89. Orwin retired at the end of the 1988-89 season.